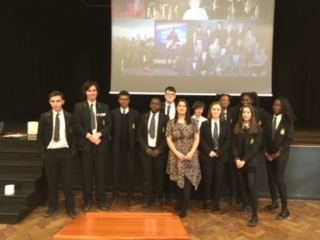 On Monday 4th February Ashley Porter-Exley came in to school to speak to our Y11 students. Ashley, who won series 3 of BBC’s ‘The Young Apprentice’, is from Wath. She spoke about her experience on the show and her life after school. Ashley spends much of her time speaking to young people about how they can achieve their goals and ambitions. She describes herself as being ‘Passionate about young people & education‘ and this certainly came across in her inspirational talk. Pictured are some of our Y11 students who took part in Ashley’s 20 second challenge.